After I was struck by a drunk, uninsured driver while riding my bike, I was unsure which direction to turn to get compensated for my medical bills. I was approached by at least a dozen personal injury lawyers, but I wanted someone who I could connect to as a rider. I was referred to the Cyclist-Lawyer by a couple of friends who knew her well, and so I reached out to her. After speaking with Megan, she walked me through everything that needed to take place and get done. Megan and Tracy are a pleasure to work with and always answered all my questions immediately! We are now settled, and I would highly recommend the Cyclist-Lawyer to anyone who needs her services. Her advocacy for cyclists’ safety goes above and beyond, too. It’s great to have her in your bike lane! Thank you! I already knew Megan from working on her bikes in one of the local bike shops in Golden Colorado and about her line of work, only ever jokingly talking to fellow employees about needing her service. We knew her as one of the friendly faces that always had cool bikes to work on and brought us delicious home baked goods. In bike racing, it’s important to know your strengths and weaknesses. So when I had to trade bike racing for endlessly chasing doctors and medical solutions for the years of chronic pain I’d suffered after being doored by a limo driver, I knew I couldn’t handle the insurance companies too. It was a huge relief to know that Megan had my back so I could focus on healing. With the statute of limitations closing in and me still without a solution to my pain, Megan was able to file suit and leave open the possibility of the partial hand amputation I would eventually undergo just shy of the 3 year anniversary of my accident. And when we discovered that the driver was now deceased and the limo company defunct, she was able to track down the driver’s insurance and ultimately get me a settlement that is helping me move forward to a new life. — Dawn M., Lafayette, Co.
A beautiful July morning in 2016 turned into the worst day of my life when a distracted driver of a semi-truck hit me from behind on Highway 30 near Sidney, Nebraska. I was violently ejected from my bicycle and thrown into the ditch. As I came to a stop, I knew the adrenaline was blocking my pain and I feared the worst possible injuries. I suffered a broken left arm, a labrum tear in my left shoulder, a fractured right ankle, a blood clot in my left calf and plenty of bruising. I was blessed to be alive considering I had been hit by a truck that was going approximately 60 mph! I received a call from the driver’s insurance company just two days after the crash. The adjuster assured me that all I needed to do was submit my medical bills and expenses and I would be reimbursed after medical treatments concluded. The adjuster was very kind and made it sound like a simple process. But the more I thought about that call, the more it didn’t feel right. That is when I called Megan Hottman to see if she would take on my case and she went to work right away taking the burden off of me so I could focus on healing and trying to get my life back to normal. I had learned about Megan though my years of road racing in Colorado. I wanted to be represented by a lawyer who would understand me as a cyclist and who would also understand the laws and how they applied to cyclists. Megan made the process very simple. She communicated updates on everything along the way. I was never in the dark as to the status of my case. Living in Western Nebraska was never an issue with communication as Megan always took the time for calls, and emails in a friendly, professional manner. Megan had to deal with a very difficult insurance company that didn’t seemed phased by our demands and seemed to be pushing us to trial. But Megan’s excellent negotiation skills did the trick and we were able to reach a fair settlement just over a year after my crash. I returned to racing in the spring of 2017 and Megan was encouraging me through my physical therapy and through my training on the bike. I highly recommend Megan to any cyclist who needs an advocate that truly cares about her clients! Megan’s expertise and wealth of experience not only helped with a fair conclusion to my case, but she has also encountered all of the various situations that I would not have expected and knew exactly what to do. This was my first time in this situation, but fortunately for me, it was not hers. — -Brian S., Denver, CO.
After being intentionally struck by a motorist it was nice to know I had Megan in my corner. It has been amazing working with her through this whole ordeal. Megan not only made me feel better about the current situation but she also understands how to use the law to protect cyclists. Megan keeps open and constant communication flowing so you stay up to date on your case. Megan is serious when it comes to protecting fellow cyclists on the road and I would not hesitate to call on her again. Thank you Megan! In June 2015 I was hit by an intoxicated motorist. The driver fled the scene and, thanks to the efforts of a passer-by, was later apprehended by the Colorado State Patrol. I ended up spending a day in the hospital with a concussion, a broken rib, a broken shoulder blade and the usual attendant lacerations and road rash. My wife and I didn’t really know where to begin. Fortunately, I contacted Megan on the advice of a friend. It was the best decision I could have made. From our first conversation, the degree to which Megan values the safety and rights of cyclists is obvious. The amount of time she spends fighting for cyclists through all available avenues is impressive. Whether it’s educating people, advocacy, or in the courtroom, Megan is always working for cyclists. In addition to being passionate about cycling, she’s easy to talk to and is always up-beat and positive. I recall when my friend gave me Megan’s business card. He described her as “a bulldog.” That’s certainly true, in the best way possible. She’s a tenacious fighter for cyclists and will not see her clients get short-changed. The entire process took over a year with actions both in the civil courts with our claim against the driver’s insurance company and in the criminal system as we dealt with the prosecution of the driver that hit me. Megan was always available to answer questions with regard to our civil action. She also went beyond expectations by attending hearings and meetings with me as the criminal case made its way through the court system, to provide additional advice and support. She also helped me think through and prepare my statement to the court at the driver’s sentencing hearing. It was an excellent opportunity to further the cycling community’s agenda of seeing that people that victimize cyclists are dealt with seriously by the courts and we wanted to make sure we got it right. When everything was finished, we could not have been happier with the results. We ended up with a resolution with the insurance company that was beyond anything we could have expected. The intoxicated driver was sentenced to a six-year prison term, the maximum allowable under the District Attorney’s plea agreement. While out on a ride in rural El Paso county I was struck from behind by a car. The driver was cited and convicted of careless driving. While recovering from my injuries I attempted to contact the driver’s insurance. They failed to respond after several attempts. While researching car-bike accidents I ran across an article in Outside magazine with a reference to Megan Hottman. I contacted Megan and am very glad that I did so. She made the whole process of dealing with the insurance companies painless so that I could concentrate on healing. She was always responsive, caring, made me feel like I was her number one client. I am not near her location so everything was handled remotely and she made this process easy. I was the victim of a bike vs. car accident back in September, and am so appreciative of Megan for handling the outcome for me.The accident left me injured, out of work, and with a stack of medical bills. My Initial thought was not to get a lawyer, I figured the responsible parties would be reasonable and we could work it out in a sensible way. Very quickly I was brought to the reality of dealing with insurance companies. Suddenly the vehicle hitting me was my fault, they wanted me to make legal statements and questioned me as if I was the guilty party, when I was merely the victim . It was at this moment I realized I needed help dealing with the accident. If I had not contacted Megan I would have paid thousands of dollars in medical bills I was not responsible for. unfortunately, my experience taught me that this is not unusual in the insurance claim world, which was so foreign to me. My wife and I are avid cyclists. We were on our way to San Diego for a cycling event. I was hit by a car while out for a short bike ride prior to starting the final leg of our journey. The driver of the car was distracted by some activity, other than driving, when he made a left turn directly into my path of travel down the bike lane. I recall seeing the car top the hill a hundred yards or so ahead of me and to my left. I do not recall seeing him start his turn or much of anything else until I found myself sitting in the middle of the road bleeding and confused. I ended up with a nasty shoulder separation and required surgery to both hands to repair ligaments and broken bones in my thumbs. My bike ended up some 10 yards down the street from me and was heavily damaged. I initially considered myself lucky and figured my case was too small to involve a lawyer. The driver’s insurance company initially showed signs of being “reasonable” to work with. I quickly encountered several of the games insurance companies employ to frustrate, delay and ultimately attempt to pay very little of an accident victim’s losses. I realized I needed help. I didn’t want to become a victim of the insurance companies’ “process.” I needed to focus on healing and getting back to my work and life. A friend mentioned he had seen a “bicycle lawyer” named Megan Hottman speak at a cycling event in Denver. I called Megan. Megan impressed me from our first meeting. Her depth of experience, knowledge and passion for getting a fair settlement for her clients was clear. I felt a great weight lifted when Megan took my case. Megan kept me informed on progress every step of the way. There was never any doubt I had found the right person to guide me through this mess. I first met Megan almost 5 yrs ago when I was hit by a car on my bike. One sunny August morning during my typical ride a car turned left in front of me and I hit it in the right front quarter panel. Once I realized I was hit I had landed (on my feet) on the other side of the car. I broke 6 ribs in 2 spots and punctured a lung. By the grace of God I walked out of the hospital on day 9. As I was lying in the ER I was thinking “I need to call Megan”, and I believe I did try calling her sometime that day or the next. I trusted Megan’s expertise and knew she would work diligently to get a fair settlement. Megan earned my trust during my first accident, so I had little stress over the legal details, which allowed me to focus on healing. The insurance companies were playing hard ball (as usual) but Megan’s negotiating skills eventually came out on top. She kept me informed during the entire process and was available to answer all my questions. Ms. Hottman represented me in a recent car crash claim where I suffered property damage. She impressed me with her quick attention to detail, her unmatched knowledge of the industry we were navigating, and her unbending dedication to working on the solution I needed. She succeeded in (painlessly to me) achieving more from my settlement than I thought possible, and doing so with professionalism and courtesy and exactly the right amount of assertiveness, always controlling the process. I felt I was her top priority, though I know Ms. Hottman must be an incredibly busy woman as she is very well respected and sought. Ms. Hottman earned my trust and involved me in the necessary aspects of my case without overwhelming me. She stayed on top of my timeline, and anticipated my questions and needs, and I’m extremely confident that I could not have obtained a better outcome from any other attorney. I was particularly impressed with Ms. Hottman’s desire to obtain what I needed, and be willing to fight for me. If I had to add a negative comment it would be that I am disappointed I didn’t engage her sooner. I learned a lot after with my accident. I didn’t want to be a a jerk, I didn’t realize I was hurt at the scene. I didn’t file the report right away, get the witnesses name or do go immediately to an orthopedist. All these things made my case a tough one to pursue. Megan went after this full force fighting my up hill battle. I can’t thank her enough for how it turned out. A friend referred me to Megan Hottman after an auto/bike accident. The sheriff officer cited the driver for careless driving, but I knew right away that dealing with the insurance, my own insurance included, was going to be a major undertaking. Megan was very responsive and set my wife and I at ease as she took care of all dealings with the insurance, bike appraisal, sheriff’s office, and the district attorney. She even got me in to see a great orthopedic physician on short notice. All I had to do was work on getting back to health. As I sit here silently by myself, I’m just beginning to start to process all of this. As I reflect back to the day of the incident and every day since it’s a little overwhelming and brings me to tears. You were the only attorney to take my case. And 14 months after the accident. I’m not sure why you did, but regardless I’ll never be able to explain to you how much that means to me. Hiring Megan after I was nearly killed in a bike/auto accident last summer was the smartest decision I could have made. From our very first phone call to discuss the case through final settlement, I could not have asked for better representation. At our first face to face meeting, Megan promised my wife and I that she would treat us just as she would like to be treated as a client. We immediately felt as if we were under Megan’s protection and knew with her on our side, everything would turn out all right. Megan has taken care of us as if we were family, making us feel safe, informed, and looked after throughout the entire process. Megan is the rare talent who completely connects and empathizes with her clients while keeping the professional barrier intact. Megan was 110% professional and at the same time gave us a level of service we would have expected from a close friend or family member. She fought hard to get us a maximum payout while also helping us adjust to life after the accident, always encouraging us to focus on the good and to remain strong. Thank you for your hard work on my incident. I never imagined how complicated it would become. You handled all the details for me so I could focus on recovering and continuing to work. I would not have had enough time to deal with the insurance claims and property damage and you made quick work of both. You definitely relieved me of alot of stress throughout the process. I am very grateful for the recommendations you made for physical therapy, they made the recovery process much quicker. I am very glad that you are looking out for the interests of cyclist and protecting our rights. I will recommend your services to other cyclist in need. Hopefully drivers will be more aware of cyclists in the future but if not I know you will be there to help us. Last year I was manning a tent with a friend at the Venus de Miles in Prospect and we saw these gals ride in with TCL jerseys so my friend promptly said “you gotta get that info and see if this lawyer can help with your accident” (I was side swiped while in bike lane)…. Megan’s determination from the moment my partner and walked into her office until the last day we stood and shook hands was superb. After going back and forth with the driver’s insurer and not getting a reasonable response, contacting Megan was the thing to do; no more exhaustive effort from me was needed, Megan had things under control within 2 days. I must say that I am not thrilled by the content of many of the letters on this page - that being bicycle vs. car incidents! But I am thrilled that, being one of the many who have had run-ins with cars while on their bikes, I too found an attorney who was attuned to the needs of cyclists who have to navigate the world of insurance companies, medical providers, and the legal ins and outs of doing so. I was hit on my bicycle last July while commuting to my job at a bike shop! The driver basically admitted that he had taken the right of way at a three-way stop and did so because he didn’t see me in the intersection. The state patrol officer who investigated the accident wrote his report in such a way that the offending driver seemed completely innocent and I, the cyclist, was portrayed as the guilty party. Because of this, the driver’s insurance company flat out denied my claim for the hospitalization, surgery, post surgery treatment, and bike replacement, etc. It was at this point that I decided that the only recourse was to hire an attorney with the hopes that I could at least recover my expenses. Mid November of 2012, I was hit broadside by a vehicle while on the pedestrian/cyclist cross walk at Santa Fe and C-470. I was sent flying about 15 feet and landed on my head and left shoulder. I was unconscious about 20 minutes. I was taken by ambulance to the ER. There, I was diagnosed with non-displaced fractures of left scapula and right thumb. Then the ER doctor informed me that I had suffered a serious concussion and I was not to ride or ski for six months. Wow, how was I going to survive without riding for that long? What was I going to do about my bike? While in the ER, a Sheriff came in to check on my condition and informed me that driver had been ticketed for failing to yield, no registration, no insurance and a revoked driver’s license with two DUI’s. Wow. A couple of weeks later, I took my damaged bike to my favorite bike shop. There, I learned of Megan and was nudged to call her. As soon as I got home, I called her. She personally answered, which already impressed me. It only took a few minutes for me to realize that I was talking with a very special person. Her demeanor, her very caring, sharp and quick grasp of my situation gave me instant confidence. I knew that I was in great hands. My very quick assessment of Megan turned out to be spot on. Megan turned out to be everything I could ever hope for in an attorney and even more. I felt supported by an amazingly competent lawyer and a true friend who was advocating on my behalf and cared for my physical and emotional well being as well. My case was brought to an exceedingly successful conclusion in August of 2013. The outcome far exceeded my expectations. — Mark A. Gould, The Law Office of Mark A. Gould, P.C. threatened to end my profession as an acupuncturist and bodyworker. Without health insurance, I was struggling to find quality care, or any practitioners willing to help me. Within 48 hours of speaking to Megan for the first time, I had a doctors visit scheduled, an MRI, and a team of people willing to treat me. Throughout the whole process I felt totally supported and confident that Megan had my best interests at heart. 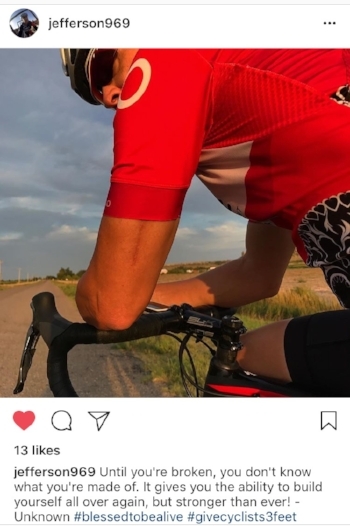 I was completing a 77-mile training ride for an upcoming century and was hit by a car exiting a strip mall driveway. I bounced off the hood of the car and ended up out of breath, on my back, with my head facing on-coming traffic. In severe pain, I crawled to safety. An ER trip and lots of tests later, I went home with broken ribs and a much greater fear of cycling with cars near-by. The driver was ticketed with failure to yield to the right of way. Navigating the insurance claims is overwhelming, and not my idea of fun. I just wanted to focus on getting well and back on my bike. The driver and her insurance company claimed I “t-boned” her car, which was standing still. REALLY?!! That’s when I called the Hottman Law Office. Megan took over my worries of dealing with the insurance companies and the games that they play. Just walking in her office space, I could tell she would be the cyclist advocate I needed, and do the very best during my case. She is very compassionate and extremely knowledgeable in her field. Through the lawsuit process, Megan communicated what to expect and was always available by phone, email, or text. I was riding my bike in the bike lane when I was right hooked by a teenage driver. I ended up in the ER with a broken shoulder, bruised ribs and a severed road rash. My bike and clothing were trashed. The driver was ticketed and I was dazed, hurt and lost. All I wanted to think about was getting better and healing. On top of that, the driver’s insurance company claimed I just had “tipped over” and their driver was not at fault. If you are the victim in an accident, you don’t need a lawyer if you are well-acquainted with the legal processes and have the time to file claims and deal with insurance companies, get itemized bills from your medical providers, answer subrogation letters, get estimates on repairing or replacing your bike, your kit and your accessories, get accident and witness reports from law enforcement agencies, fill out Victim Restitution Forms, send Requests for Discovery, negotiate with insurance companies, DA’s and the driver’s lawyers, as well as represent and speak for yourself in court. If the thought of this totally overwhelmed you, then contact Megan! She took me immediately as a client and gently walked me through the steps of what to expect. She allowed me to concentrate on healing and getting back on my bike, while she did all the leg work. She was not only compassionate, but highly competent, knowledgeable, and thorough. She was always accessible by personal meeting, phone and/or emails. She answered all of my questions and led me through a process that I had no idea even existed. I also found her to be aggressive when she needed to be, but also very fair in what she was asking for on my behalf. In the end, she got me justice and a fair settlement. I saved thousands of dollars by retaining Megan as my attorney! On October 18th while bike commuting to work, a car pulled out in from of me from an intersection in which I had the right of way. I hit the car in the quarter panel, flew over the trunk and landed on the pavement. The (in-house) lawyer at my workplace highly recommended Megan as she is known for her professionalism and her focus on bicycle injury cases. On September 5th 2012 I was hit by a car 9 days before the US Triathlon Elite National Championships. The damage to myself and my bike forced me to miss the race and spend the remaining months of 2012 in surgery and rehab. As a professional athlete, the inability to race and train resulted in loss of income and fitness which created additional stress in addition to having to sort out medical payments, insurance claims and legal matters. At first I was reluctant to hire an attorney as I only thought I’d need one if I was going to sue the person that hit me. However, after speaking with several athletes who’d also been through something similar I realized an attorney could help even if I didn’t plan on taking anyone to court. Wow!’ is all I can say about Megan! Her work ethic and passion for cycling have made her indispensable as an attorney and a voice for cyclists! I was hit by a car while riding my bike and one of my health care providers recommended that I find an attorney. Megan came highly recommended by another cyclist. After speaking to Megan, I was less apprehensive regarding the entire process and the care I should seek; therefore I retained her services immediately. After being severely injured in an auto/bike accident, a fellow co-worker and cyclist highly recommended I contact Megan to help me navigate through the complexities my accident would hold in the near future. My co-worker expressed with great enthusiasm how Megan took it upon herself to help a fellow cyclist, who crashed in a cyclo-cross race by providing the cyclist with the information they needed. After hearing of her commitment to protecting cyclists, I contacted Megan. I e-mailed her about my situation. She, personally, called me the next day, and met me while I was still in a neck-brace. I was uneasy at first, not having dealt with lawyers before, but through talking with Megan I found she was personable and knowledgeable about what needed to be done. I retained her council the day we met. She took my case personally and dealt with the insurance companies as I recovered physically. Megan helped me recover what I lost due to the accident and urged me get back on the bike as soon as possible. She not only understood how to help me legally, but also how important cycling is to my life. Throughout my case, Megan was easily accessible at any time through phone calls, e-mails, and meetings in person. It was easy to talk with Megan; she walked me through every step of the legal process explaining and re-explaining when necessary. Megan had a personal commitment to my case, recovery, and overall well-being through out.